Back when I was a kid, I remember putting on press on nails. They came in all different kinds of colors, with or without designs, and they would stick on with this thin little sheet of glue. They were really cute, but they wouldn't normally last for more than a day or two, especially if I was really active with my hands or doing dishes. Nowadays, there are some better options out there. 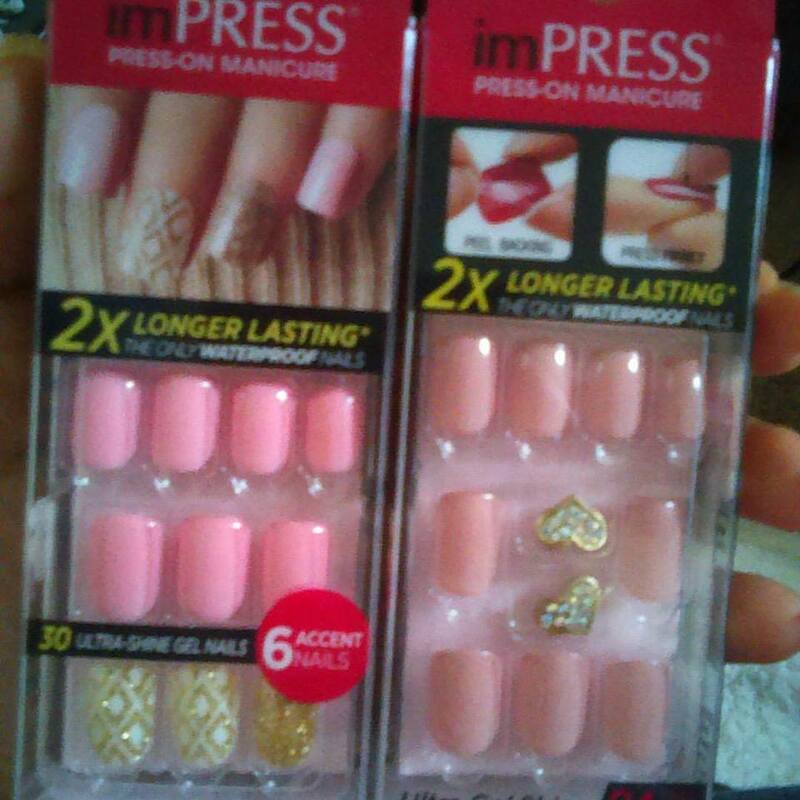 Have you ever tried #imPress press on nails? I applied the ones on the left a few days ago. They come with 30 nails, an alcohol prep pad, and a nail file. You should wash your hands first and then prep them before applying the nails. Also, it's a good idea to measure the nails to make sure they fit properly. I had to trim my nails since they were super long and these nails are quite a bit shorter. They have a glue backing on them, so you remove the backing from the nail and then press them down onto your clean, trimmed nail. Press from middle, going outward. Don't mess with them or get them wet for at least an hour. This particular pack comes with some accent nails that you can stick on whichever nails they fit. I like that I can make my nails a bit more stylish and not so boring with just one solid color. The other pack comes with little heart jewels that can be attached to the nails. I love that. These nails are on pretty strong. It has been three days and they are still on. Only one feels slightly loose, but I think it is because I do wash a lot of dishes and am constantly washing my hands. You have to when you're constantly changing diapers! I also type several times a day, so maybe that's why as well. If any do pop off, I have some extra nails to replace them with. When I want to remove them, I can just peel them off slowly, and no, they aren't supposed to cause any damage to my nails. My final thoughts on these nails? They are really nice looking, almost like gel polish, with that mega gel shine, except there is no drying time and no mess. I think they're perfect for a special occasion or event. They should stay on for a few days, if you're careful. I think that these nails are great for busy moms like myself, who really don't have enough time to go get a manicure at the salon, let alone paint their nails themselves...They have a ton of different colors and designs, with or without accent nails and gems to match virtually any outfit or mood. They cost somewhere around $7.99 a pack at Walgreens. Learn more about imPRESS nails by visiting their website here.